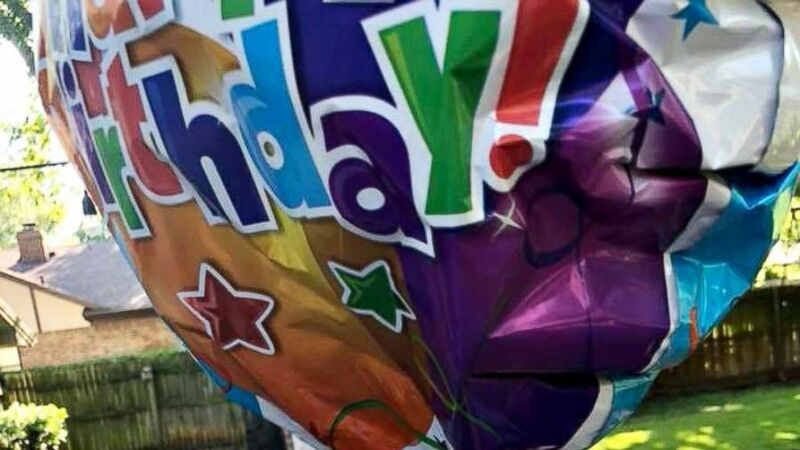 A child's balloon sent to heaven gets a heartwarming response in Texas. Who would think that notes attached to a balloon and released into the sky would bring back so much love and joy? 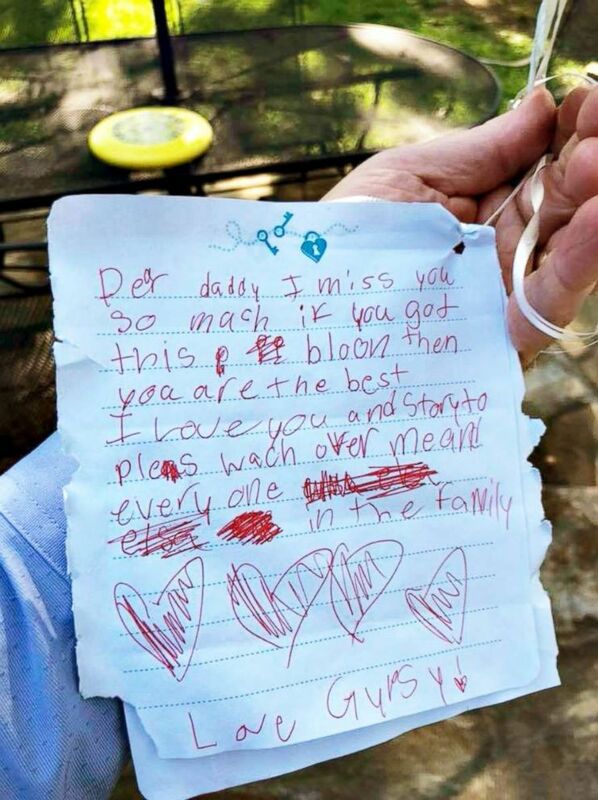 In May, two heartbroken Texas sisters - Gypsy and Story Retting - wrote moving notes to their late father and attached to a balloon and released it up to the sky - hoping that their dad would receive their messages. Gypsy, 7, and Story, 6, had been devastated since their father, Skyler Retting, passed away in 2017 from complications caused by a car accident 10 years earlier, said Tiro Western, the girl's mother. They launched the balloon a year after his death. Had he survived, Retting would be 30 this year. On a Friday morning in May, Lance Dunahoe - who lives about four miles away from the Retting in Colleyville, a suburb of Fort Worth - saw the note-bearing balloon landing in his yard as he was about to leave home for work. (Courtesy Lance Dunahoe ) This Balloon with a note for the father of two girls landed in Lance Dunahoe's backyard. “I was very curious,” he told ABC News. “It was very private messages two girls sent to their father and landed in my yard,” he said. Dunahoe, 49, a business coach and trainer, retrieved the balloons and read the notes. Touched by what he had just read, Dunahoe went back inside his house and gave his own two boys, 11 and 13, a big hug. He said the notes mean a lot to him, and caused him to reflect on himself and his kids. Dunahoe was curious about the origin of the notes, so he posted photos of the notes and the balloon on Facebook, hoping the authors would see them. He said he received an overwhelming amount of responses from his Facebook friends, asking how they could help. Western, 30, said that her two daughters have been very upset since their father passed away. She did not think that the balloon sent into the sky by Story and Gypsy would end up in a yard of a man with such a huge heart. But one of her Western's friends spotted the messages and balloon on Dunahoe's Facebook page, and alerted their mother - who had forgotten all about the balloon offering. The friend put Western and Dunahoe in touch with each other, and they spoke by phone. Western said she was stunned. 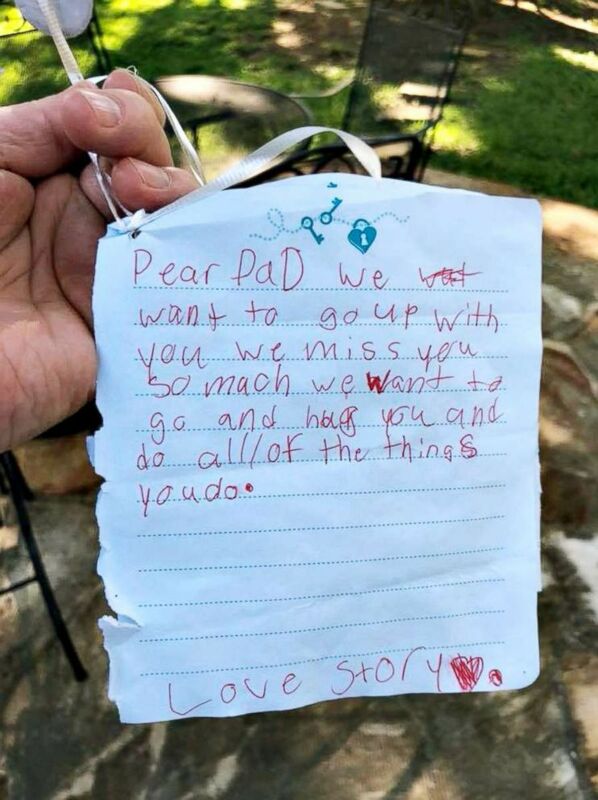 Western said she had never even read the notes the girls wrote to their dad and attached to the balloon. "It's kind of very heartbreaking - that was the first time I got to see what they wrote," Western said. "My kids are great!" The day that Dunahoe discovered the balloon, Story, who suffers from epilepsy, was admitted to a Texas hospital. The following day, Dunahoe turned up at the hospital with the balloon and the notes - and tears in his eyes. "His eyes were really watery," Western said of the family's first meeting with Dunahoe at the hospital. "I'm a daddy also," he told nine-year old Story and her eight-year old sister Gypsy. Dunahoe said he has set up GoFundMe account to help alleviate the financial burdens on Western, who babysits to make ends meet. He said the response to the GoFundMe page is stunning, and that he is "totally overwhelmed by the generosity" of the human spirit. Gypsy said that she believes her father in heaven could hear them and see them. “I really miss him,” she told ABC News. Asked what she would do to make her sick sister feel better, she said it was simple.